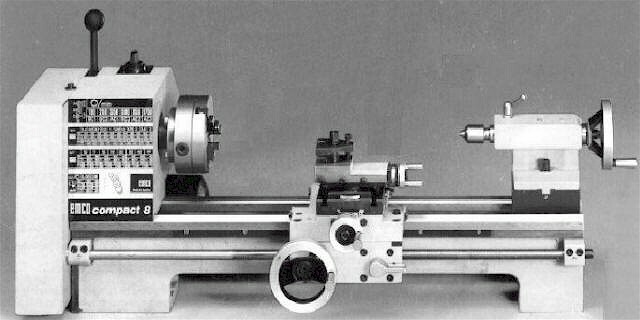 Original 8"x17" (195mm x 450mm) Emco-Maier Compact 8 (Austria), father of the current breed of 9x20 lathes. 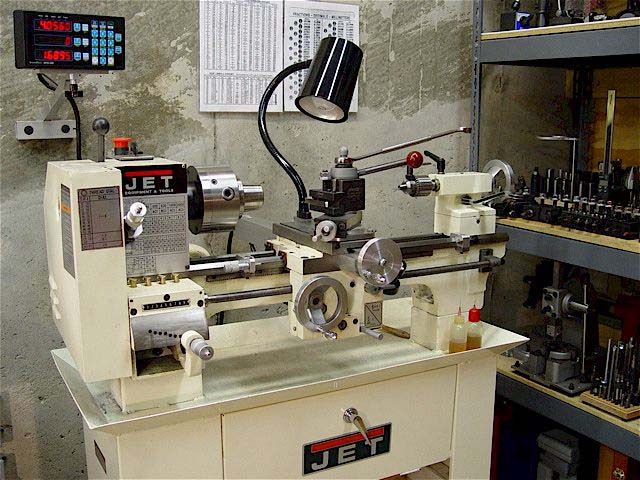 DRO-equipped Jet 9x20 belt drive metal lathe Model BD-920N & S-920N stand manual. The lathe is at the upper limits of weight & size that I could safely move down a hill & into my lower level walkout. 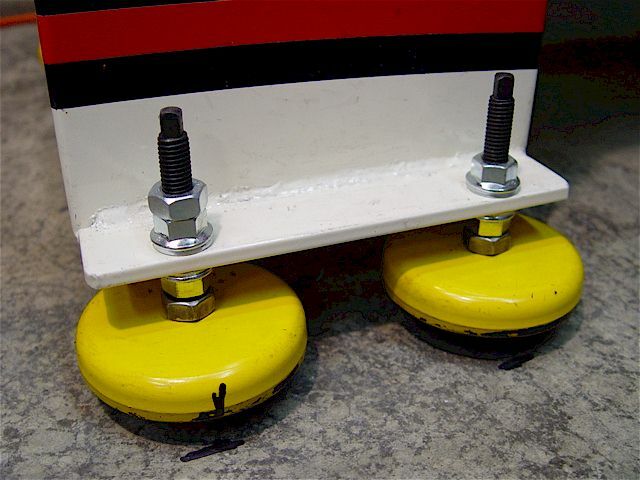 Swing Over Cross Slide 5-5/16"
Max Tool Size 1/2" x 1/2"
Max Compound Slide Travel 1-7/8"
Max Cross Slide Travel 5"
Steady Rest Capacity 1/4" x 1-7/8"
Follow Rest Capacity 1/4" x 1-1/8"
Jet BD-920N Belt Lathe Pulley Ratios See the variable-speed DC motor upgrade. 5M710 belt (USA) for heavy and/or high RPM loads. A 85 teeth 170XL050 timing belt is on the motor. The Gates 5M710 Polyflex V-belt is metric. 5M denotes (a Metric) 5mm top width (3/16"). 710 denotes 710mm (27.95") outside length. The first number is the belt length in inches. 170 = 17.0"
The letters denote the pitch or the peak to peak tooth spacing. 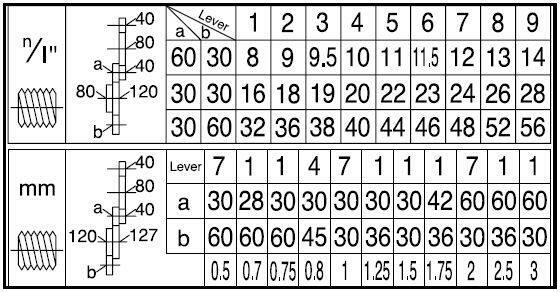 XL = 1/5"
The last number is the belt width in inches. 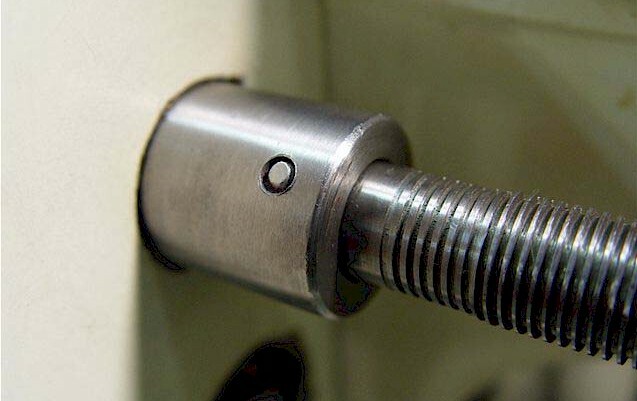 050 = 1/2"
Aluminum safety shear pin at the gearbox output shaft connection to the lead screw. 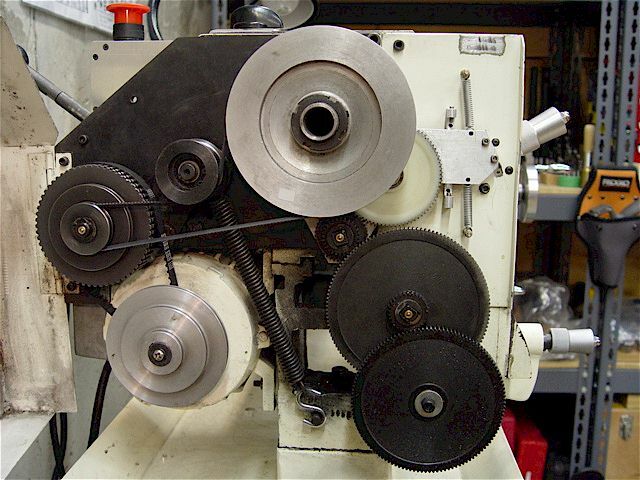 OEM safety features: pulley slip-clutch (lowest speed), thin V-belt drive, & plastic lead screw gear. The 9x20 variable speed DC motor upgrade eliminated the problematic slip-clutch & the weak V-belt. A metal gear can be substituted for the plastic version but gearbox noise will substantially increase. 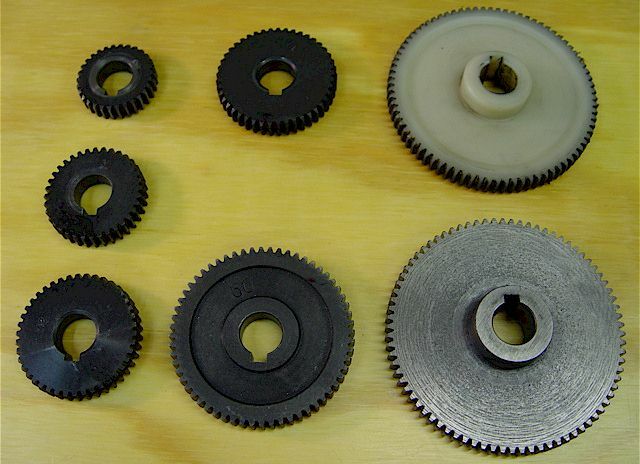 Gear ratios for feed rates. See Jet feed gears. differ among the machines (Jet vs. Enco). Bought additional gear sizes (120T, 127T) to have more ratios. since that is where most of the weight is located; six mounts total. They allow easy leveling of the machine. Check the front-to-back leveling on both the left & right sides of the bed to insure that it is not twisted.